Our unique open access model is simple. eCommunity™ builds, owns and manages a new fiber network we will deliver into your home and/or business seperate of your existing cable and/or phone lines. We do not sell services to you directly however, we provide you access to multiple providers that do. Companies such as Internet Service Providers (ISP), Phone Providers, TV Providers, Application Providers and many others use our network to deliver any type, variation and service options they sell that best fits your needs and budget. You can choose one provider to deliver all of your services or have different providers deliver à la carte. The choice is all yours. More Choice | better service | lower cost. eCommunity™ is ready to embrace alternative service options that benefit consumers. We don’t believe that consumers should be forced into bundled packages. We believe that consumers should have the right to choose what services they want and have providers compete to provide it to them. Because we don’t believe that the Internet is the final destination for connectivity, we are exploring ways to enable consumers to get à la carte services void of having to first pay for Internet access. 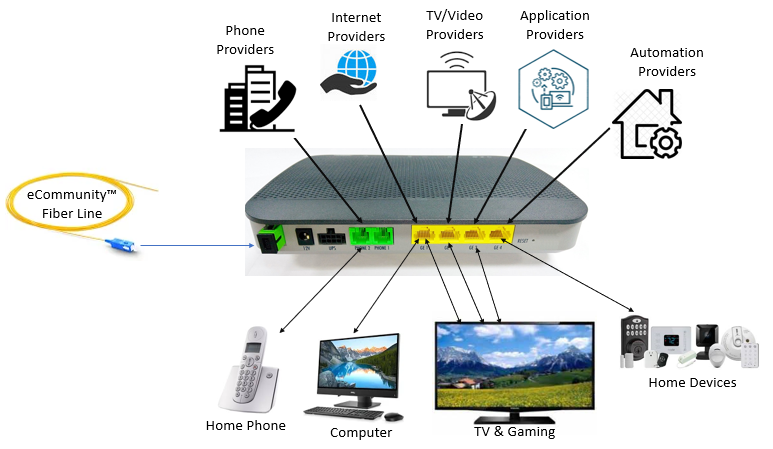 Imagine watching your favorite streaming video service at home or playing your favorite streaming video game, all in high-resolution, without having the Internet. With eCommunity™, the possibilities are unlimited. eCommunity™ is a great enabler of alternative programs such as TeleHealth, Tele-Education, Workforce Development, etc. by providing direct connect access seperate from your Internet service. We're rolling out hundred of miles of fiber in Alabama and Georgia and have plans to expand to other states. Our goal is to deliver fiber first to rural towns, low-income urban neighborhoods, and neglected industrial corridors. These areas have historically been underserved by the local cable and phone providers. We believe that everyone deserves access to more options. To find out where we are building fiber, click the link below. We know what it is like to have your utility services cut off due to an economic hardship. We believe that broadband is a utility and therefore is a critical service. Because we own our fiber all the way to your home, no other company can disconnect it. As a result, we work with local non-profits and government agencies to help them deliver their community-based services, content, and resources directly to households that can't afford Internet. Follow us via Facebook @eCommunityNet to get details as to where we are deliving fiber and when we will be in your neighborhood. Help us expand eCommunity into neighboring towns, cities and counties! to help tackle a wide range of socio-economic barriers. It all starts with you. Let us know if you are ready to help spread the word! eCommunity is more than a network, it is a game changer. Our goal is to Bridge the Digital Divide by ensuring that everyone has ubiquitous access to broadband. We will accomplish this goal by building open access fiber networks in communities to a) stimulate broadband competition; b) improve services while lowering cost; and c) providing direct access to ePrograms such as telehealth, tele-education, etc. without the Internet. We believe that everyone should have access to broadband. It is no longer a luxury, it is a bassis necessity. Because each eCommunity is formed locally, it remains rooted in the community where citizens, businesses, and government agencies can help ensure equal connectivity to all citizens. Each eCommunity is majority-owned and/or operated by parent company A2D; an Open Access Fiber Carrier (CLEC). We do not provide Internet, TV, Phone or any other consumer-based broadband services to anyone connected to an eCommunity Network.